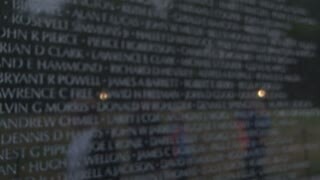 Search Results for "vietnam memorial"
Vietnam Veterans Memorial names on wall 4K. The Vietnam Veterans Memorial is a 3 acre national memorial in Washington, DC. It honors U.S. service members of the U.S. armed forces who fought in the Vietnam War. The memorial has three parts. 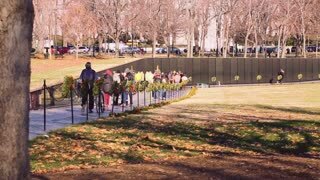 Vietnam Veterans Memorial tourist along name reflecting wall 4K. 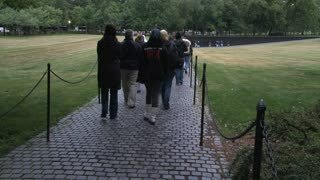 The Vietnam Veterans Memorial is a 3 acre national memorial in Washington, DC. It honors U.S. service members of the U.S. armed forces who fought in the Vietnam War. Make-shift homemade Vietnam Memorial made by a child or children to remember and pay respect and honor to their Vietnam veteran mother who passed away. 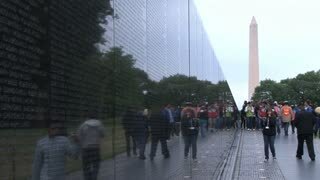 Washington DC Vietnam War Memorial tourists reflection wall 4K. The Vietnam Veterans Memorial is a 3 acre national memorial in Washington, DC. It honors U.S. service members of the U.S. armed forces who fought in the Vietnam War. Close up of the Vietnam Veterans Memorial Wall with tributes and mementos in front. The Vietnam Veteran's Memorial in Washington D.C. 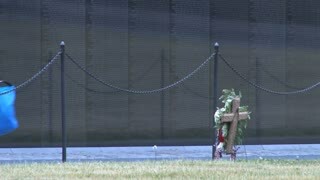 In front of the Vietnam Veterans Memorial Wall, ribbons on tributes and mementos flutter in the breeze.